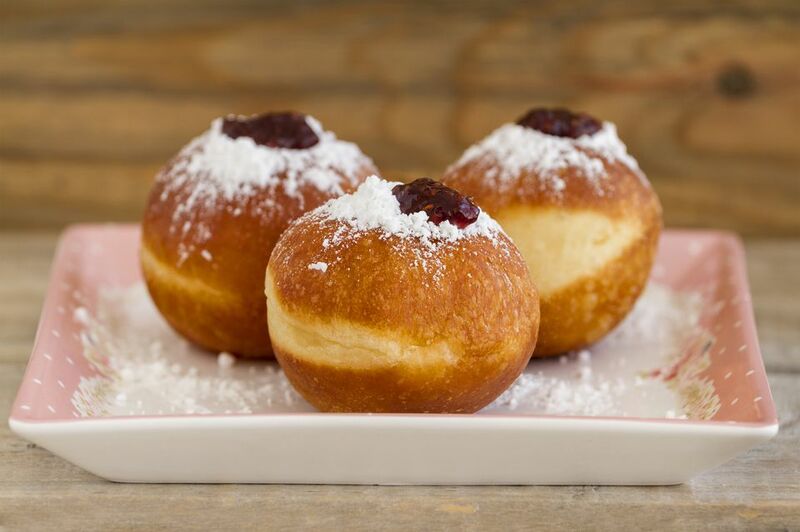 Sufganiyot are deep-fried jelly donuts that are traditionally eaten during the Jewish holiday of Hanukkah. The oil used to fry the donuts are reminiscent of the oil that miraculously burned— according to the Hanukkah story—in the ancient Temple in Jerusalem. In a small bowl, combine the yeast, 1 tablespoon flour, 1 tablespoon sugar, and water. Mix well, cover, and allow to rest until the mixture becomes foamy. In another large bowl, mix the remaining 3 cups of flour with the melted margarine, salt, remaining sugar, and the egg yolks. Add the yeast mixture to the flour mixture. Slowly pour in the water while stirring. When the batter is smooth, cover the bowl with a clean tea towel and set aside in a warm spot to rise until doubled in bulk, about 1 1/2 to 2 hours. After the batter has risen, punch it down and transfer it to a lightly floured surface. Roll out the dough to a 3/4-inch thickness. Use a round cookie cutter or a glass with a 2 1/2- to 3-inch opening to cut circles out of the dough. Place a drop of jelly or jam in the middle of each circle, and then cover with another circle of dough. Make sure that 2 circles attach well to form a closed ball with jelly in the middle. Cover the doughnuts with a clean, slightly damp tea towel and allow to rise until puffed up, about 45 minutes to 1 hour. Line a large plate or platter with several layers of paper towels and set aside. Pour 2 inches of oil into a deep, heavy-bottomed pot. Heat over medium-high heat until a deep-fry thermometer registers 350 F/180 C.
Working in batches, carefully slip the doughnuts into the oil, taking care not to crowd the pan. Fry the doughnuts on both sides until puffed and golden brown, about 2 to 3 minutes per side. Carefully remove the doughnuts with a slotted spoon and transfer to the towel-lined plates to drain. Cool slightly, sprinkle with powdered sugar and serve immediately.